Rick and I recently travelled to Down East Maine, specifically, Deer Isle and the Pilgrims Inn, to visit one of our clients. For those people from ‘away’, Down East actually is north of where we live in Kennebunkport but that area of Maine (from Penobscot Bay to the Canadian border) is referred to as Down East. Explanation for the term is as follows. “When ships sailed from Boston to ports in Maine (which were to the east of Boston), the wind was at their backs, so they were sailing downwind, hence the term ‘Down East’. Anyone who has visited Deer Isle and the surrounding area knows that it is a magical place. The air, the water, and the sun seem to deliver to visitors and natives alike, a message; ‘stay or if you cannot, come back soon.’ And people do and often. 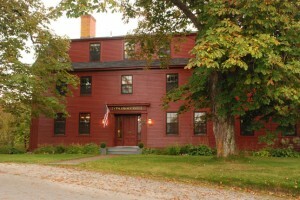 The Inn is full service and has a wonderful dining venue, the Whale’s Rib Tavern. Before dinner we stopped in the Tap Room where long time bartender Hank was working his mixology magic. We saw him actually mix an ‘Old Fashion’ the old fashioned way by muddling the orange, cherry and bitters. The Tap Room as well as the restaurant is a favorite with the locals and with Hank and Innkeepers Tina and Tony at the helm, everybody knows your name. Next to the Tap Room is the dining room located in the original barn of the property with a menu filled with a tantalizing range of food and prices. One of the specials for the evening was a Portuguese Fisherman’s Stew. We kept seeing the dish ordered and consumed and the aroma was calling us. It was great, full of seafood, locally produced chorizo and a perfect blend of spices with focaccia toast points to help clean the bowl. We ended the evening talking to guests from Florida and North Carolina who often make Deer Isle a part of their travel plans. The Inn has wonderful common rooms to relax after dinner with coffee or a drink, unwind, chat and meet new friends. With belly’s full and eyes drooping, the room slowly emptied of guests, knowing that a great room and comfortable bed was waiting upstairs. Our room, # 9, overlooks Northeast Harbor and we opened our windows to take advantage of the cool night air, a great way to sleep! We at The B&B Team are privileged to work with great Inns and great Innkeepers. Throw in some good eats and what could be better. So sailing (driving) upwind we returned ‘up to Kennebunkport’ after thanking our hosts for a great Down East stay at the Pilgrim’s Inn. If you have the opportunity, visit the Inn before they close for the season on October 16th….you’re in for a treat! This entry was posted on Tuesday, October 5th, 2010 at 2:15 pm	and is filed under Food & Beverage, Innkeeping Business, Inns for Sale. You can follow any responses to this entry through the RSS 2.0 feed. Both comments and pings are currently closed.